Before you can begin your kitchen renovation project, you will need to select a slab of granite. And before that, you will need to select a vendor. You want to choose a vendor that will allow you to purchase whole slabs rather than prefabricated pieces of granite. This not only saves you money, it also guarantees the quality of the stone and lets you create a countertop with exactly the dimensions you need. In a previous blog post, we explained how to measure and calculate the dimensions of your stone countertops to determine how much granite you will need for your project. Consult that post, and use those measurements to help construct a template of your countertop with plywood. Your vendor or contractor should be able to perform this step for you as necessary. 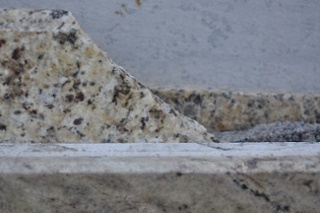 Granite is one of the hardest substances on earth, making it nearly impossible to cut yourself. At Granite Selection, we switched from conventional diamond-tipped blades to an ultra-precise cutting laser to cut your granite slab to the exact specifications of your template. First, go under your kitchen sink and turn off the water and disconnect all tubes and hoses attached to the sink. At this point, tou can remove your sink from the countertop by prying it out with a screwdriver or crowbar. Simply carve away the caulk, glue, or rubber lining around the edges and lift one side until you can get a good grip. Score the edges of the backsplash along the wall to remove any caulk or glue and prevent damage to your paint, drywall, or wallpaper. Then gently pry the backsplash from the wall with a screwdriver or crowbar. To detach your countertop, begin by looking for any screws that may be fastening in to your cabinetry. They may hidden behind the cabinets or cutaways. 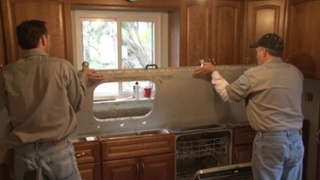 Then pry the countertop off after scraping away glue and/or caulk that is holding it on. Remove your old appliances by switching off any electrical circuits leading to your kitchen or countertop area. Pull out any ranges, ovens, dishwashers, and other appliances that are attached or obstruct the countertop. 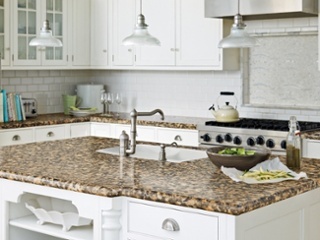 Now that your countertop and appliances have been removed, you can finally install your beautiful new granite countertop! Position the granite pieces on top of your cabinetry and affix it to your sink and appliances with the holes your granite vendor or designer have fabricated for you. 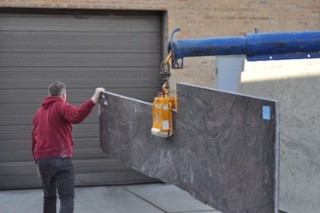 Enjoy your new granite countertop for years to come!